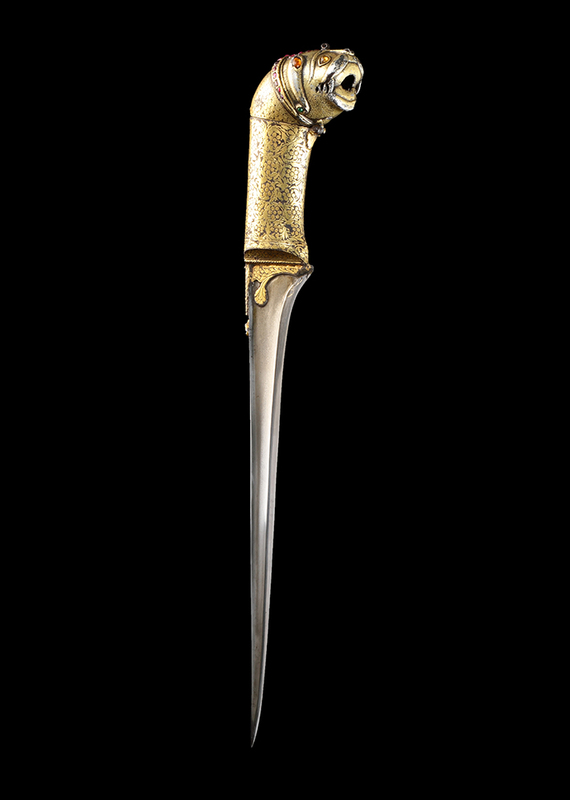 Of all-steel construction, this exceptional dagger’s hilt is made up of two main components: the grip and the pommel. Both are hollow, with the pommel moulded to show a lion’s head that opens by means of a single hinge at the base of its neck, providing a space for the storage of a dry substance. The lion proudly boasts superb details and generous decoration: the large ears are set with orange-toned citrines and an emerald at each base, while the hypnotising eyes are picked out with yellow citrines. The curving eyebrows merge into a long human-like nose as thick whiskers, almost moustache-like, sit above an open mouth, its sharp teeth revealed. A crown (or collar) of tapering rubies lies resplendent behind the ears adjacent to a ‘tikka’ of eight rubies surrounding a central citrine on the beast’s forehead. The grip is beautifully decorated with many flowerheads, the spaces between them filled with abundant, flowing leaves—a design that continues over the bolster and onto the base of the blade. Also reinforcing this junction is the lengthy backstrap that sits along part of the blade’s spine and this too is richly bejewelled with a further seven rubies and another emerald. This blade has a T-shaped cross-section and has been forged from desirable wootz steel, the associated watery patterns visible playing within the wide fuller that runs almost to the very tip. The exceptional quality of this piece denotes its association with a person of great importance and its style indicates 18th century work. The lion was often used to signify royal connections by Rajputs and Mughals alike, and the opulent use of jewels is another indication of Mughal influence upon this Rajput design. My thanks to Jvala Singh for pointing out the opium reference.